We know from research that a child’s earliest years (from birth to age five) are among the most crucial for healthy development. Mental health — or social and emotional wellness — is a critical component. According to the Center for the Developing Child at Harvard University, the foundation for sound mental health is built early in life as early experiences shape the architecture of the developing brain. Disruptions in this developmental process can impair a child’s capacities for learning and relating to others, with lifelong implications. For society, many costly problems, ranging from the failure to complete high school to incarceration to homelessness, could be dramatically reduced if attention were paid to improving children’s environments in terms of relationships and experiences early in life. Recognizing its potential impact on Colorado communities, Rose Community Foundation started exploring the issue of early childhood mental health in 2011. Our Child and Family Development and Health Program Areas began working together. They reached out to Caring for Colorado to form a collaborative group of Colorado funders spanning health and early childhood disciplines, with the intention of increasing their collective knowledge. Long-term health is also a concern. “We know from brain research that repeated exposure to adverse experiences in early childhood can lead to increased health risks as an adult, including heart disease, diabetes and depression,” says Whitney Gustin Connor, Rose Community Foundation senior program officer for Health. To help address issues like these before they worsen down the road, early identification and whole family support are among proven best practices. “Colorado has many programs doing great work in these areas. Yet many Colorado families, especially those in vulnerable situations still struggle to get the support they need,” explains Jeannie Ritter, former first lady of Colorado, mental health ambassador for the Mental Health Center of Denver, and Rose Community Foundation trustee. In 2015, the funders collaborative made a significant move to help improve the situation. Eight partners pooled $11.2 million to create a five year initiative called LAUNCH Together modeled after a highly successful (and similarly named) federal program. Rose Community Foundation is among the funding partners and serves as fiscal sponsor, while the nonprofit organization Early Milestones Colorado, is managing the initiative. Through LAUNCH Together, grants are awarded to selected Colorado communities to plan and implement coordinated support systems for early childhood mental health. “The ultimate goal is that everyone involved in a young child’s life — child care providers, schools, family members and doctors — is paying attention to his or her social and emotional health and that there’s coordination between all the systems to ensure the right support for children and their families,” explains Ritter. LAUNCH Together communities will focus their planning efforts around five key prevention and wellness strategies: 1) integration of behavioral health into primary care; 2) mental health consultation in early care and education settings; 3) enhanced home visiting services; 4) parent education and family strengthening; and 5) assessment and screening. LAUNCH stands for Linking Actions for Unmet Needs in Children’s Health. 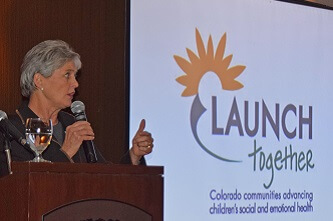 Learn more about LAUNCH Together at launchtogethercolorado.org. Learn more about Rose Community Foundation’s work in early childhood mental health, including an initial assessment and report, at https://rcfdenver.org/what-we-do/focus-areas/child-and-family-development/.